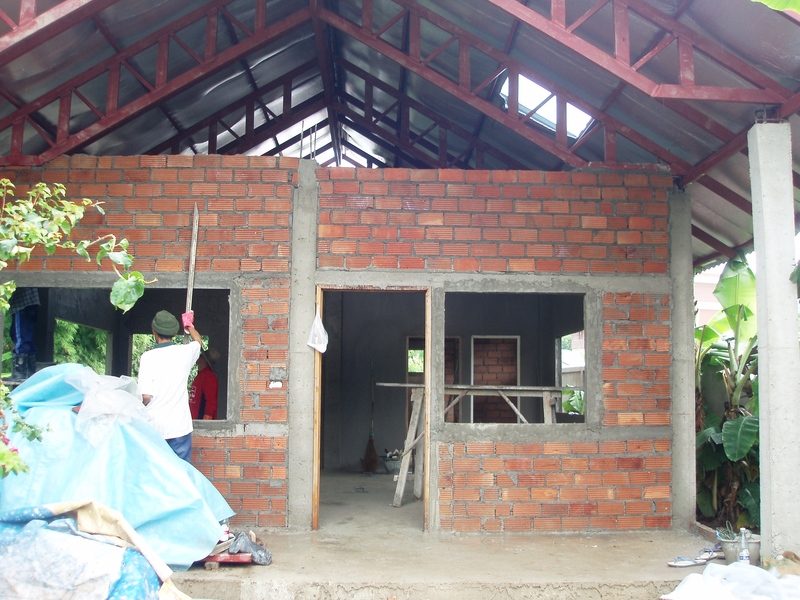 We just built a house in Thailand. I have often stated on this blog and in other writings that I think that an Expat coming to Thailand should consider renting a place to live and leave the owning and building of a home to others. I still believe that. I just read about a condo for sale here. Beautiful place. 3.9 million baht. I wonder why the guy wants to sell. If you bought it how long would it be before you wanted to sell? Wouldn’t renting just as nice a place be a better idea? Do you really need to own a condo in Thailand, or a house for that matter? There are a great many reasons for Expats not to build a house here, not the least of which is that we have very limited rights to land ownership in Thailand. Here is my list. 2. Unless you are an architect or engineer you probably don’t know what you are doing and your contractor will probably never understand what you want. 3. It will be at least a year before your home will be finished. Add the rent you pay for that time to the price of the house to get a better idea of the cost. 4. You will very often see people move into a beautiful new home and for years the only furniture in the house will be a television set. There’s a reason for this. The cost of a house will be much more than you think. Here are some of the added expenses your builder will probably forget to tell you about. Change ownership taxes, mortgage interest payments, furniture, closets, kitchen, stove, refrigerator, air conditioning, utensils, screens, window bars, garden, internet connection, satellite TV. 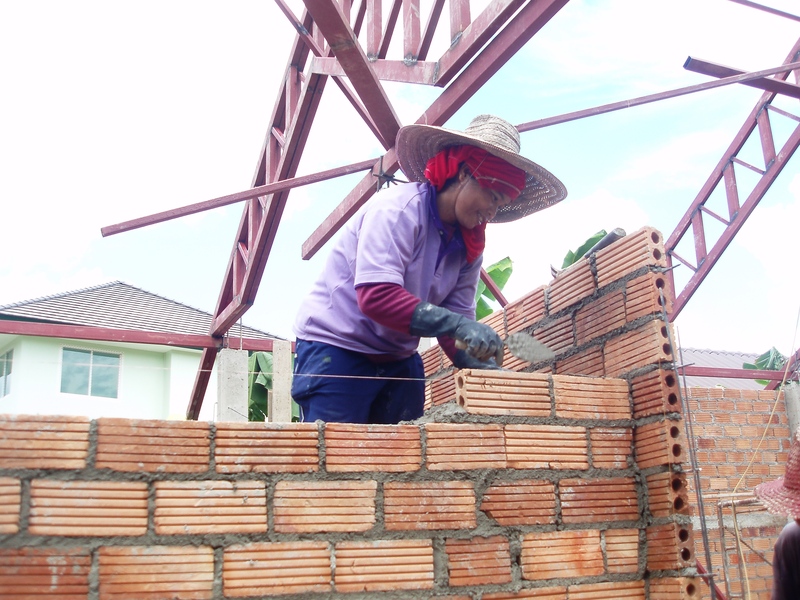 Let’s say the builder says that the house will cost 2 million baht. You will probably need to spend between 3 and 4 million before you even move in. 6. Real estate does not appreciate in Thailand the same as it does in the west and often land with houses on them actually depreciate. 7. Resale – when it’s time to sell you might not find any buyers. Thais don’t often buy “second hand” houses and prefer new ones. Sometimes the only ones interested are new Farangs looking to buy. 8. There are much better investment options – invest and pay the rent with your interest earnings. 9. You don’t know who your neighbors will be or what might be built right next to you. 10. Unless you hold Thai citizenship the land that the house is on will never be in your name. BTW, we do own our house here but we bought it already built (so we knew everything that was and could go wrong with it) and we didn’t have to go through the stress of waiting for our house to be finished before we could move in. And we have been married for 40 years so even though my wife often feels like throwing me out of the house (like I have seen happen again and again to older Expats who have built a house for their younger paramores), it probably won’t happen (for now at least). And my children are Thai citizens so they will inherit the house after we go on to our next lives. If you are in this situation then buying might be a good idea. If not, then renting is probably a better idea. So now we have ignored all that advice and went and built a house in Thailand. Below I give the answers to Why we did it, and for those crazy enough to want to build here like us, I have described How we built the house by listing many of the steps that we needed to take to get the job finished. For the real crazies you might want to pick up this book: How to Buy Land and Build a House in Thailand, Paiboon Publishing. Many retired people cannot live completely on their Social Security or pension. Most of us look for other ways to produce an income from our investments. If we have been frugal enough we should have something put away which we can have in a safe, income producing investment. For me that used to be short term treasury bills, CDs, and money market funds (getting 4% – 5% was good enough for me). Currently the 3 month treasury bills are giving .025% interest. A hundred thousand dollars invested at that rate would give you about $250 a year (wouldn’t even keep me in ice cream). Money market funds and CDs are not much better. Thai long term fixed bank deposits, another fairly safe place to put ones money (for now anyway) might give as much as 3%. That would give you about $250 per month. Not much of an improvement and nowhere producing enough of an income to make a dent in our monthly expenses. So, where to find some kind of income from my investments? We have a small piece of land (in my wife’s name of course) which was standing idle and on which we decided to build a small bungalow as a rental. We decided to make it Expat friendly (western kitchen and bathroom, large rooms, air conditioned, tall ceilings, skylight, washer) so we could attract a fellow retiree or two, just like us. From my calculations, if we kept the building costs down and since we already owned the land, we could make about 14% a year return on investment (If we had to buy the land that the house stands on then the return would be closer to 7% – still miles ahead of anything we are getting now.) And the money would be in Thai baht so that would mean that we would have to bring in that much less foreign currency and save on transfer fees and exchange rates. That’s the plan anyway. I’ll let you know in subsequent posts how that works out. 1. We got an architect to draw up the designs of our house. My wife, the real designer, sat down with the architect and told him exactly what she wanted. He drew up the plans, she checked them, then he redrew the plans, and they did that until she got what she wanted. The plans had everything from the number and size of the roof struts to the wiring and plumbing, and how far we are from the neighbor’s wall on one side and a small stream on the other. Why an architect? Because he knows lots more about materials and their strengths and weaknesses and costs than any of us do. He also knows the property laws and regulations. And he will give you detailed plans that can be sent to the land department and given to the construction foreman that will be readable. Architects do cost money though. I just heard from a friend whose architect asked for an arm and a leg payment plus a percentage of the cost of the house. We were a little more careful. 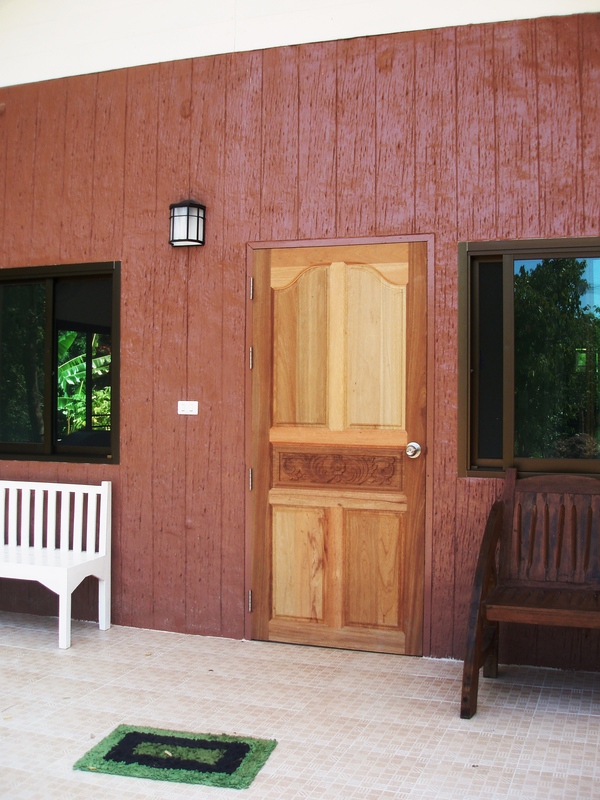 Besides this small bungalow (5,000 baht for the plans) we have also designed a large two story house (10,000 baht). Paying an architect much more than that and you are either building a palace and/or a really fancy place, or you’re just getting ripped off. do your homework on this one. 2. We wanted to save money so we went with standard Thai materials and designs. You can get lots of really fancy stuff here and have all kinds of crazy roof designs and multi levels. Just take a gander at a Thai soap opera and see the marble and gilding they build with and their “Gone with the Wind” type staircases and Louis XIV furniture. For us, the simpler the better. Also, if you are going to build something that the builders aren’t familiar with then you better make sure they know what you want. Remember, none, repeat, none of the workers live in a home anything like what you will be building. You may want a large bathroom with a sunken Jacuzzi and lots of amenities, but they will return home to a WC probably without flush toilets. A friend got furious when the workers put on his automatic garage door backwards. For one thing, he wasn’t there when they were installing it. For another, the builders had never even seen a garage with a door, let alone an automatic garage door opener. Can you really blame them? 3. We took our plans to the local land department. They of course sent us back to make some changes. Our architect did what they requested. And voila, permit in hand. Without the architect it probably would have taken months, and if we had complained about the change requests then we would still be waiting. It is a game with the bureaucracy anywhere. Learn how to play the game. 4. We chose a good builder. He was someone with good references and who we knew could keep to a time schedule and budget. He had a team of reliable workers (almost all Shan tribes people from Burma). I have seen some of these big construction companies having problems with not enough workers. They have a number of projects going at the same time and they will pull your workers off to go help on the other projects. A house going up next to us went for a weeks with only 2 – 3 workers. Nothing much went on for almost a month before the other workers returned. Note that we did not farm the whole project out. 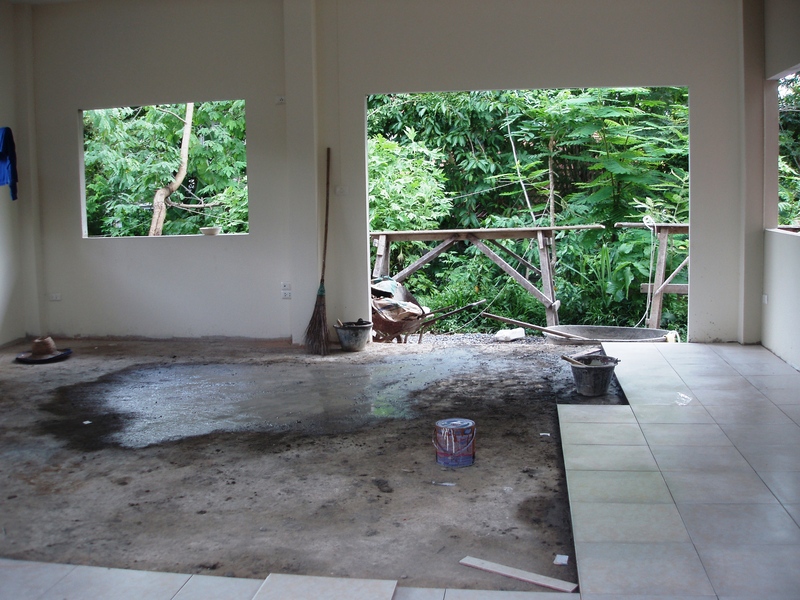 We chose and bought all the building material and we hired the specialists to do their things. 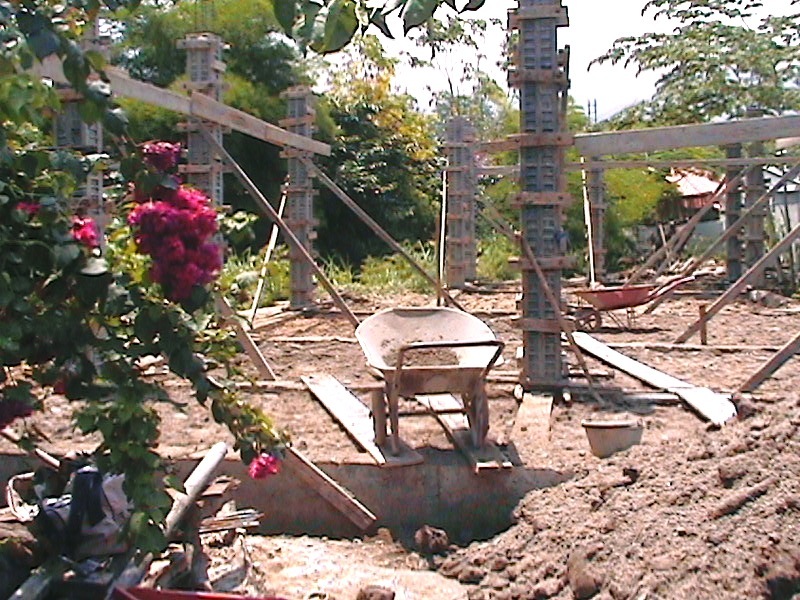 The builder hired the regular workers and made sure that the work flowed. By taking responsibility for the materials and specialist we made sure we got the quality of material and work that we wanted and probably saved about 25% on the total cost. 5. My wife was on the work site every day. We live right next door so that wasn’t too hard. She visited at least a half dozen times a day (I would pass by a few times a day smiling and looking like I knew what I was looking at. ), each time seemingly finding something that needed tweaking. If she hadn’t been there then the little tweaks would have turned into big rebuilds – making everyone unhappy. 6. Every few days we would buy lunch, or snacks for the workers. We supplied them with drinks and ice, and a shady place to rest (Chiang Mai workers all take an hour nap after lunch, a siesta if you will, that may not be the case in other parts of Thailand.) Happy workers are productive workers. 7. We got a really good electrician and made sure to tell him everywhere we wanted a light, a switch, an outlet, hot water heaters, air conditioners, washing machines, etc. Don’t forget the outdoor lighting and the gate bell. Make sure he uses the best materials and grounds everything. 8. The best thing we did was to use the highest quality insulation for the roof. That is a cost we, or our tenants, won’t regret, especially in the hot season. 9. We got a really good window guy and put in sliding, aluminum windows and a large sliding door. Also, the tiling people are quite skilled, as was the door hangers, and the painters. Wow! That’s lots to think about. I am glad that my wife was the job foreman. I know I couldn’t have done it. 10. 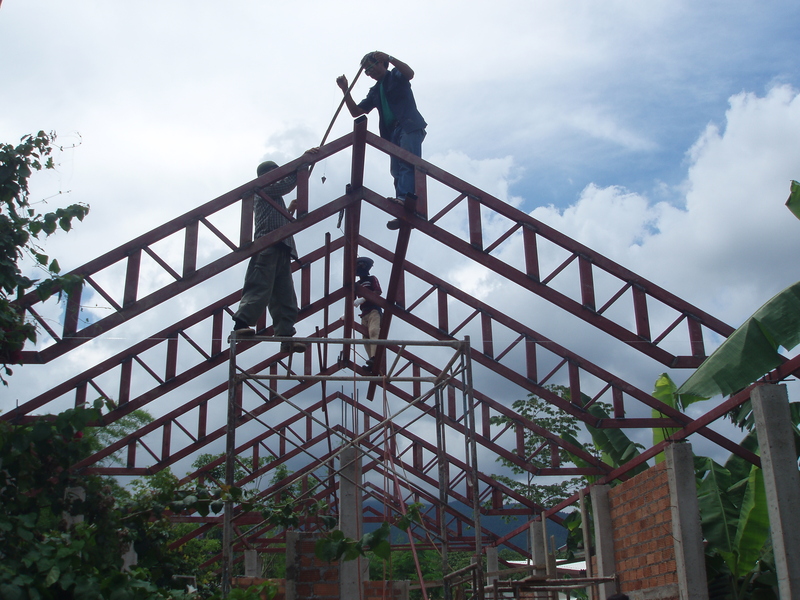 Two months to the day and the work was done – and this was the rainy season. We threw a big party for the workers to bless the house and show our gratitude for all their hard work. Cost of the project: 8,500 baht per sq meter. Now we will wait to see if anyone is interested. And if the U.S. defaults on its debts and I don’t get my social Security check next month then we are really going to need the extra income. Wish us luck. Our son Darin has been earning his living partly as a web designer (he designed this website, http://bloomingmindmedia.com/). He can develop his sites anywhere in the world since everything now is kept on the “Cloud”. So, because the great Pacific Northwest is quite dreary in the winter months, and Chiang Mai is wonderful, he comes here for a few months each year. And lucky for him, we built a house (or a bungalow as we call it) where he can live while he is here. I guess you can say that is another reason for building a house.